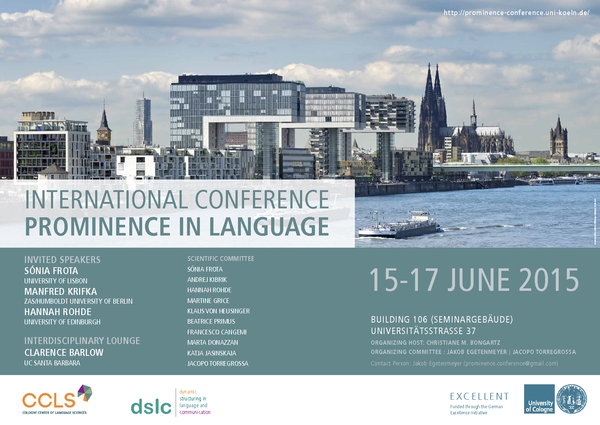 International Conference "Prominence in Language"
The second International Conference "Prominence in Language"
UPDATE: The notifications of acceptance will be sent around mid of March 2018. From April 1 to June 15, 2018, registration will be open. The call for papers can be found here. The deadline has been extended to 22 January 2018. ERROR: Content Element with uid "103960" and type "templavoila_pi1" has no rendering definition! ERROR: Content Element with uid "105130" and type "templavoila_pi1" has no rendering definition!